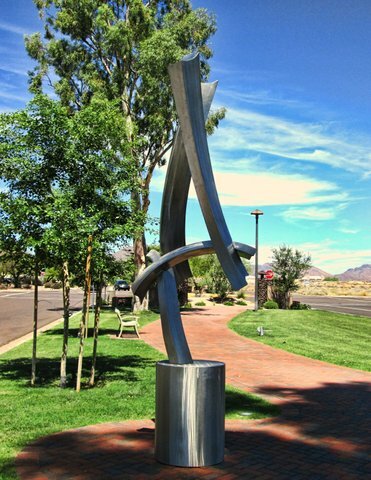 Fountain Hills’ Docent Led Art Walks: The Key to a Spectacular Public Collection! 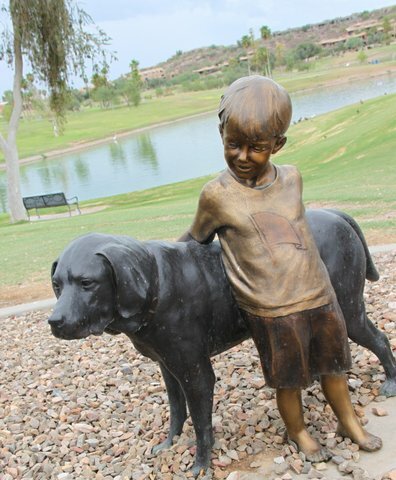 Fountain Hills’ Public Art Collection is one of the largest and most interesting collections in the Southwest. Assembled over a span of 10 years, the 144 piece collection graces the pedestrian-friendly heart of the Town. Centennial Circle Tour 9:00 – 10:30 a.m.
Fountain Park Tour 11:00 a.m. – 12:30 p.m.
Flat Art Tour 9:00 – 10:30 a.m.
Community Center/Library Tour 9:00 – 10:30 a.m.
Spanning an amazing array of styles, the powerful collection is even more striking when viewed within Arizona’s natural desert beauty. It is important to note that all of the pieces are paid for by private donation, and are placed and cared for by the Town. The volunteer docents enhance the art experience with their knowledge and insight. 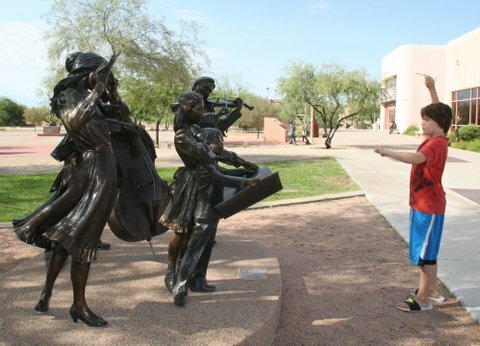 These tours are a grand way to share Fountain Hills with visitors, and club and group outings are welcomed. The plaza between the Community Center and the Library/Museum complex contains the Centennial Circle sculpture garden. Additionally, dozens of bronzes, murals, paintings, photography, and three-dimensional art are displayed inside the River of Time Museum, the Community Center, the Library and Town Hall. Most of the sculptures in this part of the collection have QR codes, which enables you to use your I-Phone to hear the narration for a self-tour at your own pace. The newly-revamped Avenue of the Fountains is home to a number of familiar pieces, and 6 additional sculptures are slated for selection and placement in 2016-17. The majestic Fountain Spirit is the latest addition to the collection that shimmers in the reflection of our glorious winter sun. The Fountain Park docent tour circles Town Lake, and includes a pass by our “Fount Rushmore,” featuring the likeness of Teddy Roosevelt, George Washington, Thomas Jefferson and Abraham Lincoln. 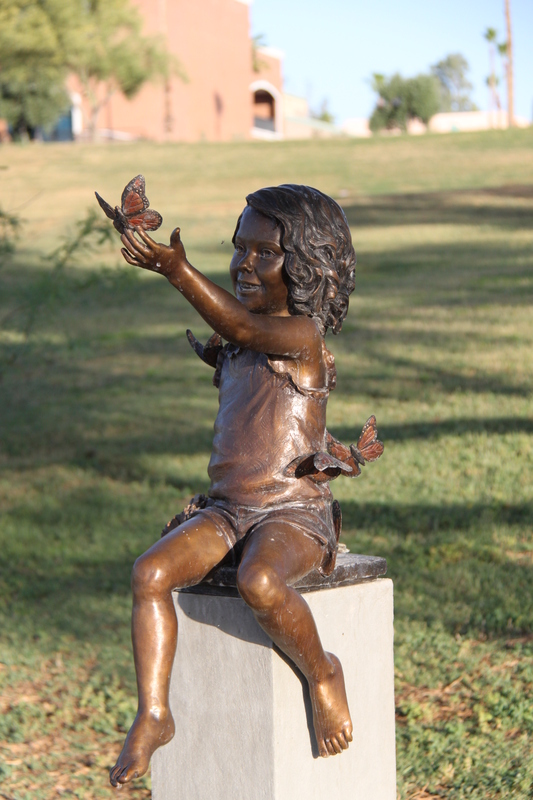 Many of the whimsical pieces near the playground invite touching and exploring by little ones for an introduction to art they will long remember. Flat Art Tours at the in the Community Center area are held on Wednesdays only, and the dates and times for the all tours may vary with weather and Town event considerations. Free registration is required as the groups are kept an intimate size. Each participant will receive an Art Walk brochure for future reference. Or call 480-816-5151 for more information or special group scheduling and registration. This entry was posted in Area Events, Arts and tagged Fountain Hills Docent Led Art Walks. Bookmark the permalink.